Determine your goals for starting a social media plan: Every business has different reasons for wanting to start using social media. In order to create and effective strategy that will stick, you need to sit down and determine the who, what, why, where, when and how of what you see as your goals. Who is the demographic: Using a tool like the Forrester Social Technographics ladder, it is critical to determine how your audience is using social media. What platforms they are on, are they the creators, users, participants or observers. This will help dictate which tool and which medium, such as video, chat rooms, or microblogging, would be appropriate to use. Get the word out: Through family, friends, colleagues, co-workers. Any way you can. Use online tools such as PitchEngine to help take your press releases online and allow people to share your releases through social networking. Spend time building relationships online: Even before you set up your business on the different social platforms, you need to spend time – lots of time – building relationships. Once you have chosen the platforms your business will be focusing on, you need to strengthen the relationship with your Fans, Followers, Circles and Connections. It is through your relationships that the word-of-mouth about your company will spread. In any strategy, it is critical to be present, be consistent and be engaged. Create Quality Content: Creating great content is the most important part of any social media plan. Success in social media comes from creating online conversations about your business, your brand, your products and promotions. By offering quality content, it allows your audience to connect with you, it allows them to see you and your Brand as human. Set up your profiles: After establishing where your audience is online, you can decide which tools to use. In setting up these social platforms for your business, you need to fill out profile in their entirety, including pictures. There’s nothing worse than being followed on Twitter by an egg with no bio. Track your results: Once you have a plan in place, it is important that evaluate the impact of your social media efforts. 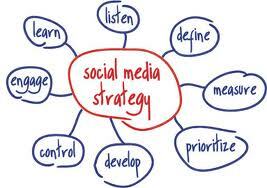 The success or failure of your strategy is determined by many factors and is directly linked to your company’s social media goals. The beauty of social media lies in its variability. Social media is changing all the time and therefore, it is critical to continuously monitor and grow what is working and change what isn’t. As a social media strategist, the advice I give businesses when they are starting to create a social media strategy is to listen. Listen to what your audience is saying and where they are saying it. I encourage them to remember that social platforms are but one small piece of the puzzle. Building real, honest and true relationships and providing good, quality content are the crux of any marketing strategy and this should be the focus of any social media plan. Blogging, commenting, liking, following, circling and engaging with others will go much farther than if you simply create a profile on a social platform and hope that others come to you. In my experience, if you follow these steps to find out the who, what, where, when and how of your audience, you will be well on your way to creating a social media plan that will stick.